The ever changing business world has seen traditional 9-5 working days being replaced with a twenty-four seven culture. With this, a new view on building security is required as it becomes increasingly difficult to keep track of who is in the building, where and when. 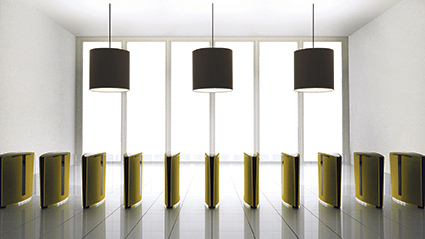 Using new technologies and premium materials, Boon Edam has developed the Speedlane Lifeline Series, an innovative and highly customisable security barrier for access control and security solutions. As the name ‘Lifeline’ indicates, the product is alive and living. A sophisticated entry management system, the Speedlane Lifeline Series is designed to be intuitive, interacting with all who approach it and guiding visitors through a secure gateway to their final destination. The Lifeline product range, which includes the slimmest security barrier in the industry, consists of three models, the Slide, Swing and Open, each of which are available in a variety of options. Whether it’s for a higher security level or disabled access, numerous combinations are possible. Recognising that each installation is different according to the client specification, the modular systems mean the product is highly customisable. Customers can accentuate their chosen product by selecting from an array of different colour options and finishes – whether making a statement, fitting with corporate identity colours or creating a harmonious interior design.